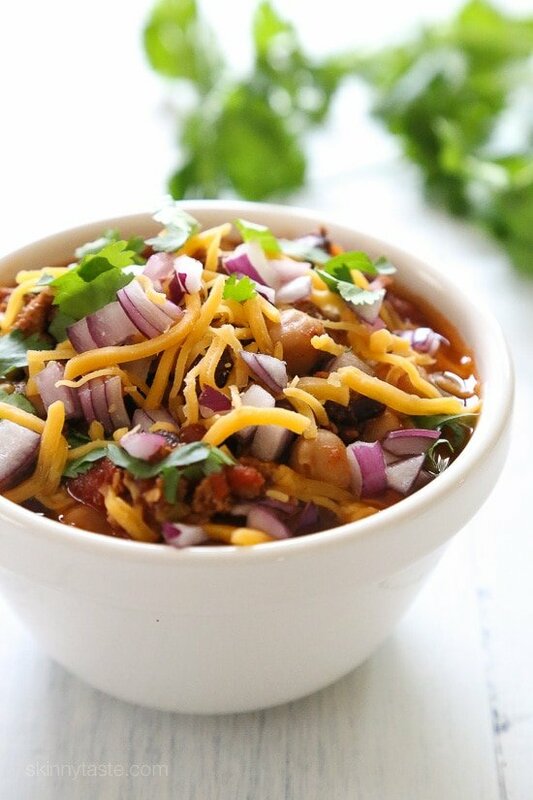 This easy turkey chili recipe uses lean ground turkey and a whole lotta beans! Make this in the slow cooker or Instant Pot, then pile on your favorite chili toppings and enjoy! More chili recipes you might enjoy are Quick Beef Chili, Turkey Chili Taco Soup, and Buffalo Chicken and Bean Chili. My brother shared this recipe with me back in 2009, many years ago when I first started this blog. I felt the photo needed some updating as well as the directions based on the questions so I recently remade, reshot and updated the directions slightly. This makes enough for leftovers, which taste even better the next day. You can prepare this the night before and turn it on in the morning, leftovers freeze great too. And since so many people ask what slow cooker I have, it’s the 6 Quart Hamilton Beach Set ‘n Forget Programmable Slow Cooker. I love it because you can adjust the time you want it to cook, and it automatically turns to warm when it’s done. It also has a probe for meat that automatically shuts off when done. I love it so much, I own three! I also love my Instant Pot, which is great when you want a meal quick. Whichever way you decide to cook it, it will be great! Brown turkey and onion in a medium skillet over medium-high heat until cooked through. Transfer to the slow cooker with the beans, chilies, chickpeas, tomatoes, tomato sauce, chili powder and cumin, mixing well. Press saute, spray with oil and brown the turkey and onion, breaking the meat up with a spoon until cooked through. Add the beans, chilies, chickpeas, tomatoes, tomato sauce, chili powder and cumin, mixing well. Cook on high pressure 25 minutes. Natural release. I made this and it was so delicious. It is a staple in the fridge to keep me on track for weight loss. The flavor and spice is perfect and satisfying to the palet. I forgot to get canned chopped green chilies, so I used about 4 T of chipotle peppers in adobo sauce-added about 28 oz of water, and it gave it a different, smoky and super-hot flair! This was delicious. I missed the gene in soup making….I was so surprised ….this is the best chili recipe I have ever made!Love your cookbooks too! 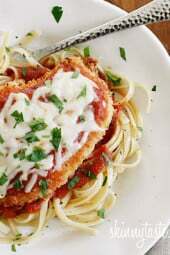 Easy, delicious and the whole family loved it! Gina, I have a small instant pot. Would you be able to add as part of the instant pot instructions, what size is mandatory? Thanks! Sure! You can half the recipe and follow the same directions. I am making this recipe this week. I cannot wait. After years of these recipes, I haven’t found one I don’t like…or that my picky boyfriend doesn’t like. You are greatly appreciated Gina!! Isn’t this missing an ingredient like broth or water? There is not enough liquid in the ingredients list to make this a soup. Any time I try making chili (this and other recipes) in my Instant Pot, I get a “burn” message and it shuts down…Any ideas? I absolutely love this recipe and my husband just can’t get enough! I am making it for a holiday party tomorrow. I wanted to double the recipe. Can I just double it by using two of everything or. ? I’m not sure why, but when I made this in my Instant Pot it said “burn.” I followed the recipe and drained the beans and tomatoes. I added some water back to the pot, so hopefully that helps. The same thing happened to me! I ended up transferring it to my crock pot and it turned out pretty good, a little more soupy than I normally like because I tried to fix the instant pot issue by adding water but it wasn’t bad. This is a terrific base recipe for turkey chili. I’ve made it many times with various tweaks based on what I have in the house. Today I browned the meat on its own, then added an orange bell pepper and some finely chopped carrot to the onion and sauteed those for a few minutes before adding to the turkey in the crock. I only had 2 cans of beans (black and kidney) so that’s what I used. I also added some chipotle chili powder along with the other spices. Delicious! I’ve made this twice, and I love it. It converted a “beef only” chili guy. The first time I made it, it was dry. My crock pot does not have a rubber seal around the lid, so it does spit. This time I used some water to scrap browned bits from browning and added that to the crock pot. I used two cans of Ro-Tel tomatoes with chilies instead of the 28 oz diced tomatoes and chilies and added 14oz can tomato sauce. It still needed a little more water after cooking on low for 11 hours. But then it was great. I could only find 93% lean turkey. Anyone know what the point value would be for this? Has anyone made this in the Instant Pot using the slow cooker option? I’ve read the slow cooker isn’t good in the instant pot because liquid doesn’t evaporate like a regular slow cooker. I bought the slow cooker IP lid and it works like any other slow cooker. I think I commented on this recipe a long time ago. It’s my go-to base chili recipe now. Originally I made it as-is (or was) and it was great. The next time, since I like more spice I tweaked it to add cumin and garlic and a little oregano. This recipe is so easy. . The original recipe was a little too watery for me so I drained about half the cans and left some with liquid. This makes it just right for me. I don’t know why some people are freaking out about the amount of liquid or spices . Just tweak it to your liking. It’s not hard!This chili recipe is awesome! This is so easy and so delicious! I’ve made it numerous times, now, and using different methods: slow-cooker, stove-top, and oven. I’ve also used different combinations of beans depending on what I have on hand (black-eyed peas in today’s instead of chickpeas), and will sometimes use firm tofu instead of my usual lean ground chicken. This recipe is so versatile! I got an Instant Pot for my birthday, and this recipe was my first attempt at using it. I’m so happy with (a) how easy it was to use thanks to the clear directions (b) how delicious the chili is, and (c) how healthy it is. I didn’t add cumin because I didn’t have it on hand, and I used chili diced tomatoes, because that’s what I did have on hand. I’ll make this recipe again…and again…and again. Great! Welcome to the IP world lol! 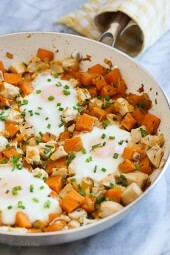 Love love love this recipe ! Oh my goodness. So healthy too. thank you Gina…you ROCK ! How long does this take in the instant pot? Thanks. This is my favorite Chilli recipe! I leave out the cumin and meat(vegetarian) and use a dried whole hot chili pepper(I take it out when the chili tastes good to me)…When I take it to potluck and there’s never leftovers! Would everything be the same to make on the stove top? Oh, and I’ve also done it stovetop (by simmering for several hours after bringing everything to a boil) and in the oven at a very low setting for several hours. Turned out great. I made this as my first recipe using my Instant Pot and I am seriously impressed by how easy it was to make and how delicious this is. After reading other comments, I did not drain the tomatoes nor the beans so the chili would not be too dry. The flavors are wonderful, the consistency is perfect, and the one cup serving is enough to fill me up. You did it again, Gina! Love this recipe so much! Put it together in the slow cooker while the Oscars were on last night and woke up to it smelling amazing. The one modification I made was I didn’t drain the tomatoes and it came out perfectly, tastes great. Definitely going to be a weekday lunch staple, thanks for the awesome recipe Gina!! I made this exactly as indicated in the recipe, and my chili was not too dry. It was delicious! I used the Instant Pot. The only thing I added at the end was a pinch of kosher salt and coarse ground pepper. I had the same burn message issue. I tried making this in the Instant Pot but kept getting a “burn” message. Any idea what I did wrong? I’m an IP newbie. I’ve made this recipe as is multiple time in the instant pot and love it! Was going to make it tonight, but double it. Do I have to do anything different? Will it be too much for an 8 quart IP? You don’t have to do anything different but I haven’t tried it in an 8qt so I am not sure. Pingback: Food and Fitness Plan 2.12.18-2.18.18 + Week Three of 50k Training! | Running makes me ____________! Rookie Instant Pot question…I just bought a 3 quart Instant Pot. Are you using the 6 quart size for your recipes? I can easily cut the ingredients in half to fit but do I need to adjust the cooking time at all? Thanks! Can’t wait to try these amazing looking recipes. Yes I use the 6 quart. Time should stay the same. Excellent recipe. Ate it several different ways. Nachos, hot dogs, by itself. Another huge hit in our house, even for the one who doesn’t like chickpeas. I’ve never thought to put cilantro on my chili, and what a difference that makes. You have never disappointed us in ANY of your recipes. Thanks again Gina!! Saw this recipe on WW Facebook (a success story, Yussy) followed the link, and decided I wanted it tonight! Had to substitute several things, which is my style! But because of time, I challenged myself to preparing it in my Wolfgang Puck pressure cooker (before Instant Pots)! We loved it, very, very filling! We ate it with Nabisco Good Thins Corn and sea salt crackers! It was so delicious!!! My husband and I are maintaining and loving #Freestyle and so excited to use more of Gina’s recipes!!! I made this recipe for the first time and its a keeper. My husband loved it as well. I do recommend the sour cream on top-added a nice flavor. I did read some of the reviews and agree about keeping some of the liquid and not draining all of it. I kept 1/4 of all the liquid from each can and used it in the crock pot and it was not dry at all. This is very filling and would be great for any party especially for the super bowl. If you don’t drain the beans – does it change the SP value? Delicious and FREE. Everyone loves this, whether they are dieting or not! For those mentioning the old recipe, it’s essentially the same just don’t drain your canned goods and omit the cumin, instead using 3tbsp of chili powder. This is my family’s favorite chili recipe! Another winning recipe! Made this one for the first time today and I’m so glad I doubled the recipe so use for lunches this week! So easy, filling, and delicious. This was the first thing I made in my Instant Pot– made it for a party (before even making it for myself to try) and everyone loved it. Now it’s a staple in my meal prep for the work week-keeps me feeling full for hours. I have also mixed in various kinds of beans. Another Skinnytaste classic. This recipe was my first-ever chili recipe and the very first SkinnyTaste recipe I made in my slow cooker. I am a single woman so I meal prep a lot and tend to eat the same thing Monday through Friday. This recipe allows me to cook once and have lunches for TWO weeks. I always pair with a serving of low fat Mexican blend shredded cheese, and a side of raw veggies. I also some cut up 1/4 of an avocado to mix in the chili at the time I am eating it. This recipe is FANTASTIC! Love this chili recipe! I make it weekly now! Even my 2 year old loves it! Now that this is 0 points for the new WW plan how much gets you 0 points before it becomes points? Would 2 or 3 cups still be 0 points? I just got my Instant Pot and tried it for the first time today making this. It turned out fantastic! I followed the recipe exactly. Will definitely be making this again. This was my first time making chili, so I was a bit nervous. But it was delicious! I had friends over who also raved about it! Little did they know it was so healthy. I made this for Dinner tonight in the Instant Pot and it is amazing! Would be able to add corn to it? I thought about doing that tonight but didn’t. This chili is delicious. I used the Instant Pot. I will be making this again!!! I just got my instant pot. This is the first recipe I made. I drained everything and after reading the comments was a little worried as I like my chili thick and hubby likes it soupy. So I went ahead and added a cup of beef broth. It turned out great! Appreciate all the great recipes and easy directions. This is definitely a keeper will make again. Pingback: 4 Ways to Eat Healthy on a Budget in 2018 – Fed. Fit. Frugal. Made this tonight and loved it. Thank you!! How long do you think this would be cooked on the stove? So excited to make this tonight. Snow day here in the south (which means no one is going anywhere) AND this is my first day on Freestyle. Loving that this is now ZERO points! Yummy! I’ve been reading comments that’s say the chili didn’t come out as moist or soupy as the old version, and I wholeheartedly disagree. I read the comments prior to me making it in my Instant Pot and didn’t drain the tomatoes bc of this so it wouldn’t be dry. I should’ve followed Gina’s recipe exactly because I found that it was waaay soupier than the original recipe, which was in my regular dinner rotation, not draining the vegetables like the commenters instructed. If you’re chili came out dry, something went array. Gina’s recipes have always been a homerun, and I should’ve followed her instructions to the letter bc she’s never disappointed me. I just realized I do not have green chilies can I substitute something for them or does it just make it a little spicier? If it just adds a spicier flavor I would be fine with leaving them out. It doesn’t make it spicy but I am sure its ok without. Thank you for all of your recipes! Especially helpful with the new plan! ???? Do you have this recipe on the stove top? And Is ok to use dry beans that have been soaking all night? Can you give the instructions for the instant pot? I just got mine this week so I’m a newbie. Thanks!! It would be great if you could add instructions for a Dutch oven with slow cooker / instant pot recipes. Thanks! This looks great! Curious what your thoughts are on the new Weight Watchers Freestyle since you’ve been a member for a while. I made this today for 6 of us – it was a great dinner, and I will make it again. I did include the liquid from the tomatoes, and am glad I did. I figured it would be on the mild side of spicy, so just put a bottle of tabasco on the table for those of us that like our food a bit hotter. 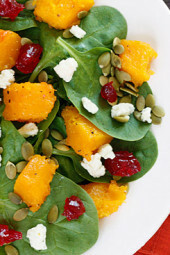 Served it with a green salad and corn bread – perfect meal for a fall night. Just made this in the IP for a church trunk or treat, and I really liked it! Mine turned out a little dry….not sure if i did something wrong? I saw people posting about the “old” recipe… can i still access that one and try both? Love your recipes, I used to hate cooking until I discovered Skinny Taste! So easy and always so delicious!! Now I love cooking your recipes! You can make it without draining the cans if you wish. Thank you! I did this in the instant pot on chili mode. I did not drain the canned tomatoes and added beans after cooking It was fantastic!! I know I’m super late to the party but just wanted to tell everyone who was asking that I made this tonight in the instant pot bc I didnt have time for the crockpot. I browned the turkey with the onion and tossed all the other ingredients in and mixed and set it to chili. It came out great! Would love to know which recipes are in the cookbooks Gina has out. I follow Skinny Taste on Facebook and print a lot of recipes. Sometimes I print a recipe that I already have in the cookbooks. Can this be cooked in a pot on the stove.? How long should I cook it for? Would it be possible to make this in a pressure cooker? Hoping to have it for dinner tonight! This is my favorite chili recipe!! Everyone in the house loves it as well. Would it change the points value if I used white beans instead of chickpeas? As with every Skinnytaste recipe I’ve tried, this chili recipe is a hit in our home! We all love Skinnytaste recipes!!! I’ve never tried a Skinny recipe that I didn’t like. I ha e this in the slow cooker now. Smells great! Could I substitute 93% lean ground beef for the turkey? Gina, this recipe is amazing! I substituted 93% Turkey so should that change the points? Thanks so much for your fabulous recipes- I recommend your website to everyone I know! I also liked the old recipe as well it was much juicier. I found when i did this new one it came out not as soupy which is what i liked about the old recipe. Why do the points say 6 when I enter into my weight watchers calculator? Wow — I had no idea about this! I was wondering why my points kept being off sometimes! I usually just put in what the #’s are off your details and then calculate because I like to have it noted that I had “skinny taste ___” and save it! (I often use the same ones over b/c i love them!). Moving forward i’ll just have to create a new recipe every time? I already did the work for you, all my SP are input into recipe builder. PS wooo — two extra points goes a long way for the past two weeks!! Does the calories count the additional toppings or is that just calories for a cup of the soup without any toppings? It does not count the “optional” toppings. This has always been my go to chili recipe but I noticed you changed it a lot – draining all the beans and tomatoes. I should’ve followed the old ones as I’m nervous this is going to be dry. Also why cumin!? This used to be just 3tbsp of chili powder and always tasted great. Does everything need cumin!? I like cumin! You can follow the old recipe if you want. Where can we find the old recipe? Why complain when someone is providing great recipes that you can always tweak to your own liking? I have a question…new cook here. When a recipe calls for a 28 oz can of tomatoes, is that the amount of the tomatoes only? I often get my canned tomatoes from Costco and break them down to save money and I don”t know how to convert it without the weight of the can. It seems the last time I made this it had more liquid. Seems dry. I didn’t drain the tomatos by mistake and glad I didnt. It would have. Been super dry I don’t remember draining all the beans last time. Is this a different recipe. ? Mine dried out, too. FYI, I have a 6-quart Hamilton Beach Set n Forget slow cooker. It didn’t burn — I just added two cups of water at the end of 7 hours cooking on high and it still turned out great. I would make this again, but next time I wouldn’t drain the tomatoes and I would add a little water or broth before I start cooking. I never drain the tomatoes because I never noticed that the recipe called for it until reading your comment. Lol. It turns out perfect every time. And I always drain and rinse the beans.